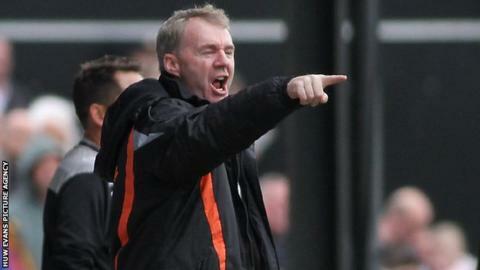 John Sheridan says he is happy with the progress being made by Newport County since taking charge. Sheridan, who replaced Terry Butcher as County manager, enjoyed his first win in four attempts at Wycombe on Tuesday. "We're slowly improving which I'm pleased about, there's a good work ethic about us," Sheridan said. "We've got to maintain it and the lads are getting used to me, so hopefully everything will go smoothly from now on." County remain bottom of League Two despite Tuesday's win, but are now only in the relegation one on goal difference. Sheridan says his team must continue to improve, with a trip to mid-table Bristol Rovers next on Saturday, 24 October. "I've got to keep on top of the players, we're still bottom of the league so I won't get carried away," said the former Republic of Ireland midfielder. "I want to see us go on a run of six or seven games, that's our aim, and first and foremost stay in this division."